Initially, the signup deadline was January 15, 2019 but due to the partial government shutdown that included Farm Service Agency (FSA) offices, the signup deadline was extended to February 14, 2019. The signup period has now ended. Before payments can be received, in addition to signing up for MFP, the 2018 production must be certified. The deadline for certifying production with FSA is May 1, 2019. A first/initial payment was authorized on half of 2018 production. 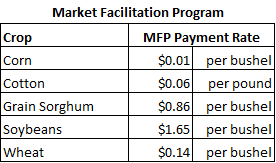 If the farm was signed up for MFP and 2018 production has already been certified, the first payment has likely already been received. A second payment—at the same MFP rate on the other half of production, was announced on December 17, 2018. If the farm is already signed up and certified the production, the second payment has also been made or should be made shortly. Producers did not need to sign up again for the second payment. If the first payment has not been or was not received, one payment for the total amount will be received. Below is an example for how the payment is calculated. Assuming a farm produced 750,000 lbs or approximately 1,500 running (gin count) bales of upland cotton lint in 2018. Unfortunately, MFP payments for cotton will be less than expected. This is due to crop loss caused by Hurricane Michael and excessive rains and delayed harvest during the entire harvest season that followed. Prior to Hurricane Michael, USDA projected the Georgia crop at 2.9 million bales or approximately 1.4 billion pounds. The MFP on that amount would have been approximately $83.5 million. The latest USDA projection for the Georgia crop is approximately 936 million pounds and MFP of $56.1 million—a 33% reduction. The limit on MFP payments is $125,000 per person or legal entity for corn, cotton, grain sorghum, soybeans, and wheat combined and applicants must have an AGI of less than $900,000. The limit on MFP is separate from the limit on ARC/PLC. Given the relative crop acreages in Georgia and the relatively small payment on corn, on average, the majority of a person or entity’s MFP will be on cotton if the operation grows cotton. For example, to reach the $125,000 payment limit from cotton only, it would require about 2 million pounds (4,340 USDA 480-lb statistical bales or about 4,183 “running bales” from the gin). At the state average yield of 693 pounds per acre, this would be equivalent to roughly 3,000 acres of cotton per person or legal entity at that yield. Had yield been higher as expected (and many producers have said they had a record crop prior to Michael), the limit would have reached the cap at much smaller production and would have been an issue for some producers. At the time of this is written, there is yet no 2018 disaster relief package but the outlook appears to be improving for having legislation soon. After months of budget negotiations, disagreements, delays, continuing resolutions, and a partial government shutdown, both the House and Senate passed the final budget package for FY19 on February 14, 2019 and President Trump signed the legislation into law on February 15, 2019. Unfortunately, although included in earlier budget bills that never fully passed through both House and Senate, 2018 disaster funding was omitted from the February 14 final FY19 legislation. This means that disaster funds will now come in the form of a separate (supplemental) appropriations bill. Recently, a bi-partisan group of Senators spearheaded by Senator David Perdue (GA) introduced legislation to the Senate for $13.6 billion in relief efforts including $3 billion for crop-related losses during 2018 due to Hurricanes Michael and Florence and other natural disasters. Details and the specific workings of the program are unknown and yet to be determined by USDA, should the legislation proceed forward and become law. From what is known, this Senate legislation seems to closely align with a similar House bill that passed back in January. Therefore, if the Senate bill passes, it should not be difficult and time-consuming to work out the differences in a conference bill. President Trump has indicated he will sign disaster legislation when it reaches his desk. It is hoped that the Senate bill can be considered and passed later this month. The WHIP Expected Value is based on the crop insurance Actual Production History (APH) for the crop and the coverage level of crop insurance elected for the crop. A WHIP factor of 70% to 90% is proposed and would be applied to the APH—the higher the insurance coverage level, the higher the WHIP factor. The WHIP Harvest Value is based on the actual yield. Insurance Indemnities would be the amount(s) received on the crop. Efforts are on-going to have the premium paid deducted from this amount. The idea or concept behind WHIP disaster assistance is to pay the producer something above what crop insurance elected on the farm would pay—to provide an additional amount above what crop insurance is going to pay. This amount will vary depending on whether the crop was insured or not and, if so, at what coverage level. 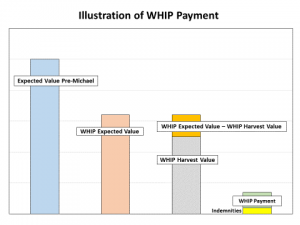 Because many producers in Georgia were anticipating a record crop, especially for non-irrigated production, it is realized that because WHIP is based on the farms APH, that any payment received cannot fully compensate for the actual loss. Any amount of payment is helpful, however. The following website illustrates an example of how WHIP worked for 2017 crop losses. The WHIP factors will have to be updated/revised based on how similar legislation would compensate for 2018 losses. Nevertheless, the illustrated example is useful in understanding the concept. Seed cotton (SC) became a covered commodity and eligible for ARC (Agricultural Risk Coverage) and PLC (Price Loss Coverage) effective with the 2018 crop—the last year of the 2014 farm bill. Seed cotton continues as a covered commodity in the new 2018 farm bill. Payment for both ARC and PLC is received on 85% of the farms seed cotton base acres. The PLC Payment is the PLC Payment Rate times the established seed cotton payment yield for the farm times 85% of the farms seed cotton base acres. Currently, the projected seed cotton PLC Payment Rate is 2.9 cents per pound. 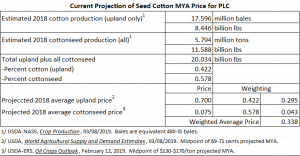 This is based on the most recent projections of the 2018 market year average (MYA) price for upland cotton and cottonseed. The SC MYA Price is a weighted average price (based on production upland cotton and all cottonseed) as shown in the table below. Currently, the SC MYA Price is projected to be 33.8 cents per pound. This is subject to change—the marketing year for 2018 cotton does not end until July 31, 2019. The PLC Reference Price for seed cotton is 36.7 cents per pound. A PLC payment is received if the SC MYA Price is less than 36.7 cents. Currently, the SC PLC projects to be 2.9 cents per pound (36.7 – 33.8 = 2.9). PLC payment is triggered by price only. The PLC payment for the crop on a farm will depend on the farms PLC Payment Yield for the crop. ARC is triggered by revenue. An ARC payment depends on county yield, not the farm’s own yield. How PLC and ARC compare is going to vary and will be specific to the farm because the amount of any PLC payment, and thus how ARC and PLC will compare, will be determined in-part by your own PLC payment yield for your farm. FSA guidelines for ARC/PLC election and enrollment for the 2019 and 2020 crops have not yet been announced. Beginning with the 2019 crop (the first year of the new farm bill), the PLC Reference Price will be allowed to “float”. A PLC Payment will be received if the MYA Price for the crop is less than the “Effective” Reference Price for the crop. The Effective Reference Price will be the higher of the Statutory Reference Price (36.7 cents, for example for seed cotton) or 85% of the 5-year OA (Olympic Average) MYA Price but not to exceed 115% of the statutory price. This “Effective Price” also impacts ARC. In ARC, this Effective Reference Price is used as a substitute for the MYA Price in calculating the Benchmark Price if the MYA Price is lower than the Effective Reference Price. Most producers have already made their seed cotton generic base allocation decision and election and enrollment of either ARC or PLC for the 2018 crop. These decisions had to be made or the producer had to already be on FSA’s list (register) waiting to be serviced by December 7, 2018. The late timing was such that ARC/PLC election and enrollment for 2018 didn’t have to be made until after the start of the 2018 crop marketing year and near the end of the 2018 growing season. This turned out to be a good thing because Hurricane Michael resulted in large yield loss in some counties and, as a result, some seed cotton bases switched to ARC rather than PLC—ARC being more likely to have a higher payout than PLC for 2018 in some situations. For the 2018 crop, a farm could have STAX insurance coverage and also have seed cotton base enrolled in ARC or PLC on the same farm. We suspect this is because the crop insurance sales closing and premium payment deadlines for 2018 spring planted crops occurred months earlier and prior to ARC/PLC election and enrollment. The sales closing deadline in Georgia, for example, is February 28th. In summary, if the seed cotton base on a farm is enrolled in ARC/PLC, all cotton acres planted on that farm are ineligible for STAX. In Georgia, the crop insurance sales closing deadline for spring planted crops like cotton is February 28th. This is likely going to be before the ARC/PLC enrollment deadline. If a producer thinks he/she may want to have STAX coverage for the farm, the producer can purchase STAX first (by the sales closing deadline) then still have the option to enroll in ARC/PLC later, prior to the premium due date, and STAX coverage will be cancelled. (Note: It is expected that STAX coverage can be cancelled but guidelines concerning this are not yet been released by RMA.) The sales closing date for 2019 spring planted crops has already passed. The producer must elect ARC or PLC for seed cotton base on the farm. In 2019, for example, the producer will elect ARC or PLC for seed cotton base for the 2019 and 2020 crops. Election does not impact the eligibility for STAX. The producer will then make a separate decision to actually enroll in ARC/PLC for the crop year. If seed cotton base on the farm is enrolled in ARC/PLC, then the farm is not eligible for STAX. ARC and STAX are similar as they are both a form of an area revenue guarantee. STAX is getting a second look mainly in situations where the cotton acres to be planted on a farm are greater than the seed cotton base on that farm or in situations where cotton will be planted and the farm has no seed cotton base. Posted in Cotton, Crop Insurance, International Trade, Policy, Row Crops. Posted in Cotton, Dairy, Fruit, International Trade, Livestock, Marketing, Policy, Pork, Row Crops. Download the PDF version of the factsheet. On December 11, 2018, the U.S. Senate passed the Agriculture Improvement Act of 2018 (2018 Farm Bill). The U.S. House Representatives passed the same version on December 12, 2018. The President of the United States is expected to sign the bill into law on December 20, 2018. The 2018 Farm Bill continues programs for Title I commodities from the 2014 Farm Bill: the Agriculture Risk Coverage (ARC) program, the Price Loss Coverage (PLC) program, and the Marketing Assistance Loans (MAL) program with Loan Deficiency Payments (LDP). Below we have identified some major changes in the new farm bill for easy reference. The election between ARC/PLC is one of the key changes for Title I commodities in the 2018 Farm Bill. The initial election will be in 2019 for the 2019 and 2020 crop years. Beginning with the 2021 crop year, producers are allowed to change their ARC/PLC program elections annually. A new effective reference price and updated PLC program yields are created for covered commodities. The statutory PLC reference prices for Title I commodities remain the same as in the 2014 Farm Bill with seed cotton added. The effective reference price permits the reference price to increase up to 115% of the statutory reference price. At the sole discretion of the owner of a farm, the owner shall have a 1-time opportunity to update the PLC payment yield, on a covered-commodity-by-covered-commodity basis. The payment yield is used in calculating the PLC payment for each covered commodity for which the PLC election is made. In the case of seed cotton, for the purposes of determining the average yield per planted acre, the average yield for seed cotton per planted acre shall be equal to 2.4 times the average yield for upland cotton per planted acre. Beginning in 2019, ARC-CO (ARC-County) payments will be based on the physical location of the farm, with farms that cross multiple counties being prorated into each county. When calculating the benchmark revenue for ARC-CO, the effective reference price will be used as part of the calculation for the 5-year Olympic average price when the effective reference price is higher than the marketing year average price. In addition, the 5-year Olympic average yield will use either the county average yield or 80% of the county transitional yield, whichever is higher for that year. Loan rates for the MAL program have increased for most commodities, except peanuts. Peanuts maintain the $355/ton loan rate and cotton will have a factor to limit year-to-year variability. Payment limits are still $125,000, with a separate payment limit for peanuts. First cousins, nieces, and nephews are going to be included in the family members eligible for payments. Unassigned base will remain unassigned and not be eligible for payments. Adjusted Gross Income limits remain at $900,000 per person or legal entity. *These authors contributed equally to this post. Posted in Cotton, Peanuts, Policy, Row Crops. We recently released a factsheet which compares between the Agricultural Risk Coverage (ARC) and Price Loss Coverage (PLC) for this year after Hurricane Michael. We conducted the analysis based on some representative counties in GA. With the hurricane causing tremendous damages to our cotton industry, a lot of counties suffer from tremendous yield losses. For some heavily-impacted counties, the yield loss might trigger for ARC payments. Below are the main points from this factsheet. Many producers were expecting very high yields for both irrigated and non-irrigated, especially non-irrigated compared to average. Some producers report little difference in yield between irrigated and non-irrigated. For 2018, ARC is most likely going to be the way to go for producers in a county with 50 to 60% or more yield loss—“loss” being measured relative to the yield that was expected pre-Michael. ARC vs PLC also depends on the farms seed cotton PLC payment yield. Landowners can update the payment yield but if this can’t be done and/or if the PLC payment yield is low compared to county yields used for ARC, then PLC may already be at a disadvantage or have less of an advantage than it otherwise have. There are uncertainties. Any PLC payment for 2018 is a moving target. The Seed Cotton (SC) Marketing Year Average (MYA) Price is yet to be determined. This will also effect ARC because the 2018 SC MYA Price partially determines 2018 Actual Revenue. The 2018 SC county yield is also TBD. We used estimates provided by UGA county Extension agents. There is also the uncertainty of another ARC/PLC election opportunity for any farm bill extension. Both House and Senate versions call for another election in a new farm bill. Click here for a PDF version of this post. Collect documentation! Prior to starting any cleanup activity, make sure to take pictures of damage and losses that have occurred. If you have crop insurance, contact your crop insurance agent to report losses or damages. It is important to do this before starting any cleanup activities so that everything can be documented properly. Furthermore, farmers need to notify their crop insurance agent within 72 hours of discovery of a loss. Beyond that, farmers should make sure that a signed written notice is provided within 15 days of the loss. If you have noninsured crop disaster assistance or are eligible for other disaster assistance programs, contact the local FSA office. It is important to do this before starting any cleanup activities so that everything can be documented properly and a waiver can be issued prior to cleanup. More information about each of these programs can be found at the above websites. In addition, there have been some specific disaster related questions which are answered below. Depending on the program, contact either your crop insurance agent or local FSA office. Make sure to take pictures of the damage and do not burn any debris. An adjuster or FSA representative will need to survey the damage, thus it is important to wait before starting any cleanup until this has happened or permission to cleanup has been granted. Keep in mind certain crop insurance deadlines. Notice to your crop insurance agent must occur before abandoning a crop within 72 hours of a loss. A written notice needs to be signed within 15 days of loss. In addition to documenting the damage and loss, keep track of expenses related to cleanup. It is advisable to keep records of all activities related to the disaster. This is a difficult question that depends on individual circumstances. Some issues that need to be considered is whether there is any salvage value of the crop and the quality of anything that can still be harvested. If it is a good crop then it should be harvested. The farmers crop insurance agent can help make a determination of how to proceed. If you don’t pick the crop, how bad will it hurt the established yield? If there is crop available to pick and you choose not to then it will count against the loss. What if a farmer has an FSA loan on a structure that was damaged? Contact the local FSA office immediately to report this damage. What additional disaster relief may become available and when? After many natural disasters that result in widespread damage there are often additional programs that become available to aid with agricultural losses. This, however, is not guaranteed and it does take time before they are available as they require a special appropriation from the U.S. Congress and signature of the President. One such example is the 2017 Wildfires and Hurricanes Indemnity Program (WHIP) that covered losses from Hurricane Irma that caused widespread damage in September 2017. Allocation for that program was not made until February 9, 2018 as part of the Bipartisan Budget Act of 2018. Sign up for that program did not begin until July 16, 2018. While a special allocation may not be immediately available, it is important to document losses and to communicate to your legislators in a way that illustrates the impact that Hurricane Michael has had on your farming operation. This information will help drive policy decisions and additional allocations that may become available. The information provided in this document is not a specific recommendation. Producers should make disaster assistance decisions in consultation with their crop insurance agent local Farm Service Agency or other government entity responsible for program administration. Posted in Beef Cattle, Cotton, Crop Insurance, Dairy, Fruit, Livestock, Peanuts, Pecan, Policy, Poultry, Resources, Row Crops, Vegetables. H.R. 2 of the 115th Congress, the Agriculture and Nutrition Act of 2018 passed by a 2-vote margin in the house on June 21, 2018. On June 25th it passed a motion to proceed in the Senate and is now being debated. There are some key differences between this bill and the current Senate version I wrote about here. At this time it is not clear which version of the Farm Bill will become law or if other changes will be made. In this post I will go through the changes the House bill makes to what is currently known as the Dairy Margin Protection Program. I will continue to post updates to http://fareblog.uga.edu as the process continues. There are several changes made to the Dairy Margin Protection Program in the House bill. Some of them address concerns the industry has voiced while others make the program cheaper and more flexible for small and medium size dairies. Below are a list of these changes. The table below details the new premiums for Tier I. 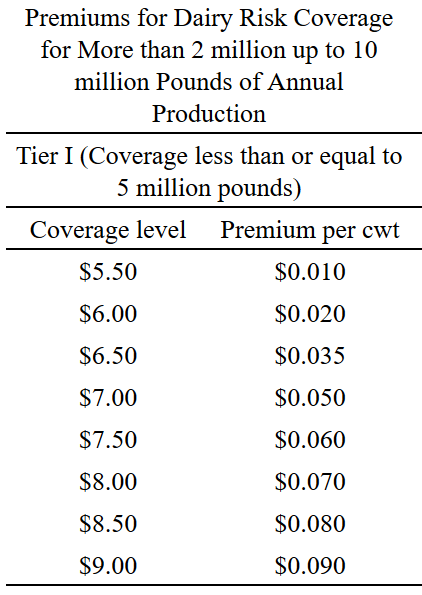 Tier II premiums are the same as in the 2014 Farm Bill. In general, Tier I premiums are about 1/5 of premiums in the 2014 Farm Bill. In general these changes make the program less costly for producers to cover 5 million pounds of milk or less. The combination of allowing producers to cover as little as 5% of their production and the significantly lower Tier I premiums accomplish this. In addition, the flexibility to use LGM and the Dairy Risk Management Program is likely to be helpful in managing risk across the entire operation. Time will tell whether the House or Senate versions or some compromise between the two make it into law. Subscribe to the blog in the upper-left corner if you’d like to receive updates in your email! UPDATE: This post has been updated to include information from Senate amendments passed June 27th and 28th, 2018. The changes have been made by marking through the previous text and adding new text after it in italics. Last night’s cloture vote on the 2018 Farm Bill in the Senate is an indication that we are progressing well on passage of a bill this year. Though that vote was for the House version of the bill (which you can read about here), I thought I’d give an update on my reading of what the Senate Ag Committee changed in Title 1 for dairy since the changes are significant. Keep in mind that things are in flux right now and that this information could be obsolete in the near future. If that is the case, I will write a new post to let you know and provide updates to the process as it unfolds. 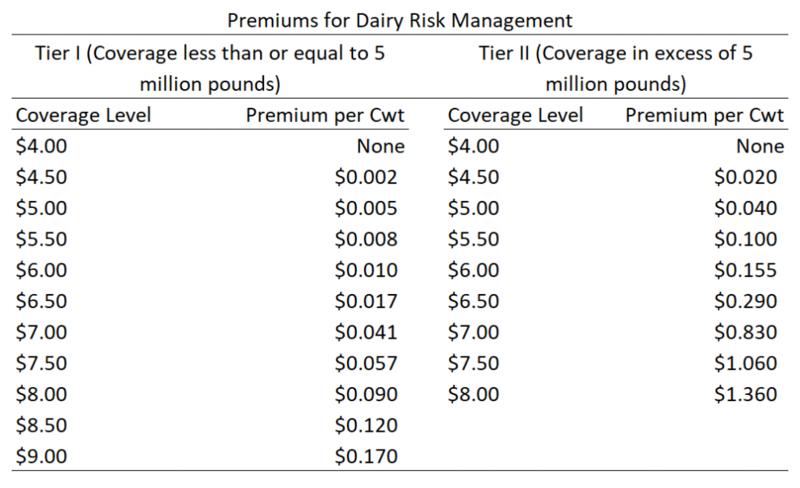 The Margin Protection Program has been renamed Dairy Risk Coverage and extends through the year 2023. The basic logic of the program remains the same, but there are significant changes to margin coverage levels and premiums. The margin calculation remains the same. Premiums are still split into two tiers and the threshold remains the same. Lower premiums for less than or equal to 5 million pounds of milk covered and higher premiums for milk covered in excess of 5 million pounds. 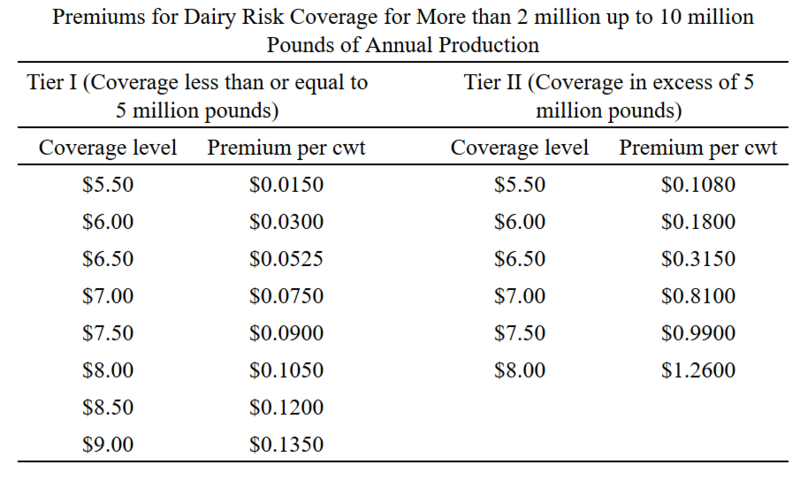 Premiums are discounted based on the dairy’s total annual production. For dairies with 10 million pounds or more of production, there is no discount. For dairies with 2 million to 10 million pounds of total annual production, there is a 25% discount on all premiums. For dairies with 2 million pounds of production or less, there is a 50% discount on all premiums. In addition to the $4.00, $4.50, $5.00, $5.50, $6.00, $6.50, $7.00, $7.50, and $8.00 margin coverage levels producers covering less than 5 million pounds of milk can choose $8.50 and $9.00 coverage levels. Producers can select a catastrophic coverage level that covers a $5.00 margin. Producers can cover 40% of historical production. No other choice of coverage level is allowed under the catastrophic coverage option. Producers who select catastrophic coverage will be required to pay an additional $100 administrative fee on top of the original $100 administrative fee carried over from the 2014 Farm Bill. There is no other premium associated with catastrophic coverage. There is no longer a 25% minimum production coverage level. Producers can choose coverage as low as 5% up to 90% of their production in 5% increments. Production history is still based on 2011-2013 production, but adjustments will end in 2019. Other changes made in the Bipartisan Budget Act of 2018 remain the same, such as the monthly calculation of the margin and payments. Producers who paid MPP premiums in excess of the indemnity payments they received in 2015, 2016, and 2017 will receive a refund of the difference between the premiums they paid and the payments they received. The tables below show the premiums for the three different levels of annual production. In general, premiums for both Tier I and Tier II are higher than the current premiums for 2018. However, these higher premiums are offset to some extent by discounts for what the proposed law calls “small and medium” dairies. The 50% discount for dairies with 2 million pounds of annual production or less pushes the new premiums lower than those in the Bipartisan Budget Act of 2018 this year. The 25% discount offsets the increase in premiums to a degree, but not completely. The program is now more flexible in that it allows producers to purchase coverage for as little as 5% of their annual production. While this doesn’t offset the higher premiums, it does allow producers to cover a smaller percentage of their production if they wish. 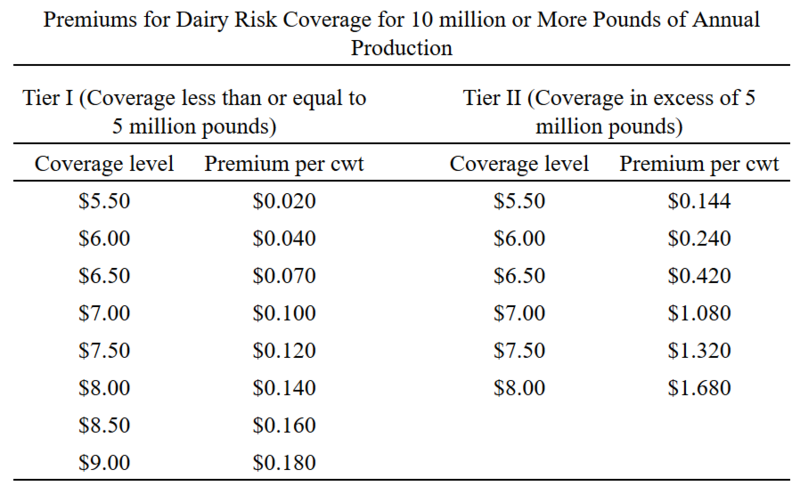 For example, a larger dairy could use hedging techniques or the new dairy insurance product created by Farm Bureau to manage most of their risk and still participate in the Dairy Risk Coverage program at a lower level. I will keep this site updated with new information as votes occur and changes are made. The legislative process leading to the next farm bill has now begun. The current 2014 farm bill will end with the 2018 crop year. On April 18, the House Agriculture Committee approved The Agriculture and Nutrition Act of 2018 (HR 2). This was the first step in the legislative process that will lead to the next/new farm bill beginning with the 2019 crop year. House consideration of the bill is expected this week (week of May 14, 2018). The Senate Ag Committee has not yet considered it’s version of the new farm bill. The Senate Ag Committee is expected to consider its version of a new farm bill in late May or possibly sometime in June. The goal remains to have the new farm bill completed this year. Debate in both the House and Senate is expected to be contentious, however, where Democrats are opposed to proposed farm bill revisions in the nutrition title. There is also, as always, likely to be debate on payment limits and payment eligibility. A factsheet titled House Ag Committee Farm Bill Proposal and Seed Cotton Program FSA Timeline (Click here to download the factsheet) discusses some of the changes in HR 2 compared to the current 2014 farm bill, discusses the remaining farm bill process, and updates to the timeline for the generic base conversion and new seed cotton program. More information can be found at Georgia Agricultural Policy Webpage. Posted in Cotton, Policy, Row Crops. Posted in Dairy, Livestock, Policy. Posted in Beef Cattle, Cotton, Dairy, Finance, Horticulture, Management, Marketing, Peanuts, Policy, Poultry, Row Crops, Turfgrass, Vegetables.